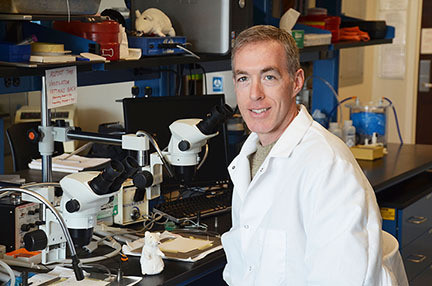 John Quindry, an Associate Professor in the School of Kinesiology, refers to himself as “a cardiac guy.” More specifically, his primary line of research is in heart attack injury prevention. A simplified version of his findings is that exercising for a few days prior to a heart attack greatly reduces the extent of the damage should the worst happen. Duchene Muscular dystrophy (DMD) occurs only in boys, and is typically diagnosed between the ages of two and five years of age. The disease knows no racial or geographic boundaries. Children with muscular dystrophy steadily become weaker, losing strength and mobility. It also affects their heart and lungs. Dystrophin is a protein that holds the walls of the heart together. Dystrophin deficiencies – or the absence of dystrophin – is the root cause of muscular dystrophy. But Quindry’s research, working in close collaboration with Dr. Joshua Selsby of Iowa State University, reveals that there is a chemical that can counteract many of the pathological aspects of this deficiency. The chemical is called quercetin, and it is found in many fruits, grains, and vegetables. Quercetin is readily-available on the market, and is sold commercially for its anti-inflammatory and antioxidant effects. Quercetin has been classified as a GRAS product (Generally Regarded As Safe) by the Food and Drug Administration and is typically consumed by humans at a similar dose used in Quindry’s mouse studies. While it is too early to declare quercetin as a clinically-viable treatment for DMD, these studies may eventually lead to clinical trials to determine effectiveness.